Successfully Added Rear View Mirror Monitor and Multimedia MP4 Player - 7 Inch, Handsfree, Bluetooth to your Shopping Cart. 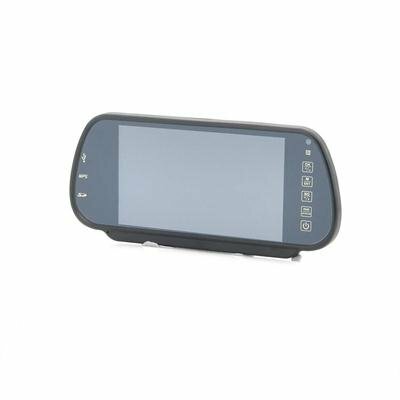 Rear View Mirror Monitor and Multimedia MP4 Player features a 7 Inch screen, Handsfree usability and Bluetooth connectivity ensuring this is a must have car accessory. Safety first is exactly what you consider when out in a vehicle, and this great device from Chinavasion can help increase that. This convenient sized car accessory will not only automatically display images from your rearview camera as you reverse, but will also function as a hands-free Bluetooth call center that is complete with handsfree, headset, A2DP Bluetooth profiles, and phone number caller ID for even more added safety as you drive. Using the Bluetooth, simply pair your Bluetooth-enabled phone and you are then able to receive calls with the touch of a button. Then by using the built-in microphone and speakers to communicate directly and handsfree. 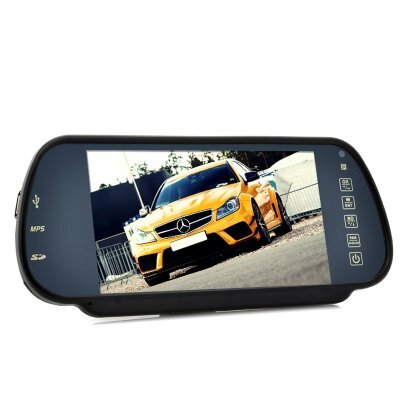 This rear view mirror does not only help you reverse safely but it also doubles up as a multimedia MP4 player so you can watch movies directly on it. Some other smart features include dual built-in loud speakers for listening to both to music or conversations from your Bluetooth cell phone. In addition, you can also insert a USB memory drive or an SD card drive to view data directly via the car rear view mirror’s 7 inch screen. Back up in style with this rear view mirror monitor. When parking the car, the rearview image appears onto the screen automatically.